I had a great Study Session on Indigos at the AQSG meeting in Bloomington on Friday. We did discuss how to tell a resist from a discharge indigo from the top of the quilt. Kay Triplet, one of the class members, had some very good thoughts...a resist may show a little leaking of color into the design if the edge of the resist print is not as thick as the center portion. The discharge print may show the opposite--a little leaking of discharge (slightly lighter color) outward from the edge of the design--as the discharge paste may 'leak' beyond the edges of the design. The other hot topic in the Indigo session was how to tell early from late Indigo prints. 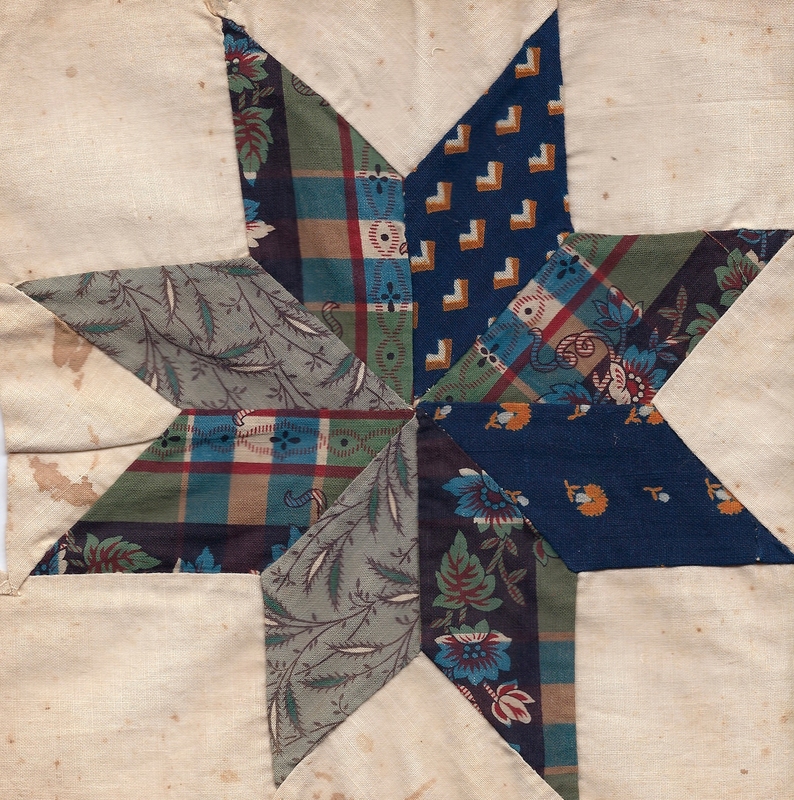 Sue Reich had a wonderful pieced quilt c. 1837 which was assorted indigos. 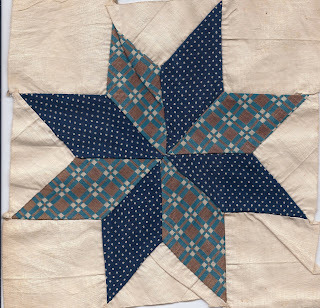 Generally I think of early Indigo patterns as being larger and fancier than those seen after the Economic Depression of 1893 when so many mills went out of business, used cheaper greige goods and went to smaller simpler designs. Sue's quilt confirmed my theory. 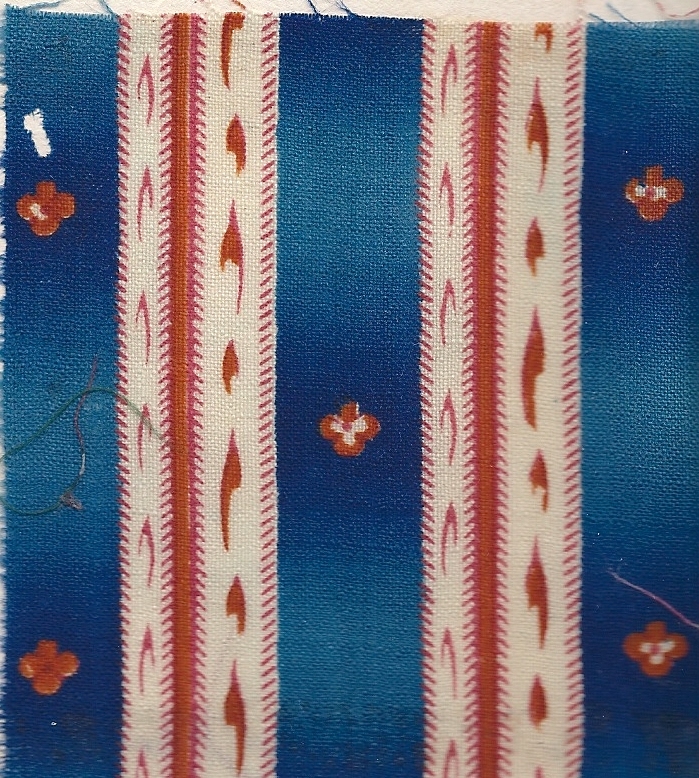 Many of the Indigo printed patterns were large and complex although there were several patterns that were tight and neat--i.e. small rings. 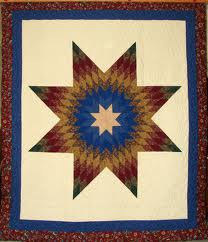 I did get some time after the Session to really look at the quilt and the Indigos ( Thank you Sue!) 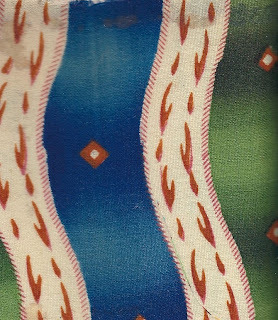 and I also noticed that some of the larger designs were on more coarsely woven grounds. 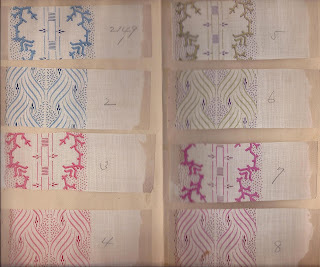 So some possible clues to early (before the last decade of the 19th century) Indigo prints are resist printing ( discharge is after 1813..in England), coarsely woven grounds and large complex patterns. One of the excellent papers presented was "Prussian Blue: Its Development as a Colorant and Use in Textiles" by Anita Loscalzo. 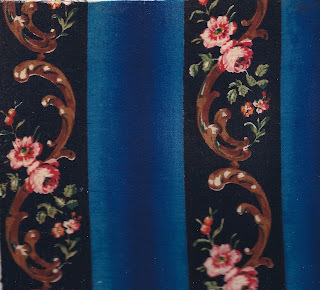 I have several sample books with wonderful Prussian Blue examples. 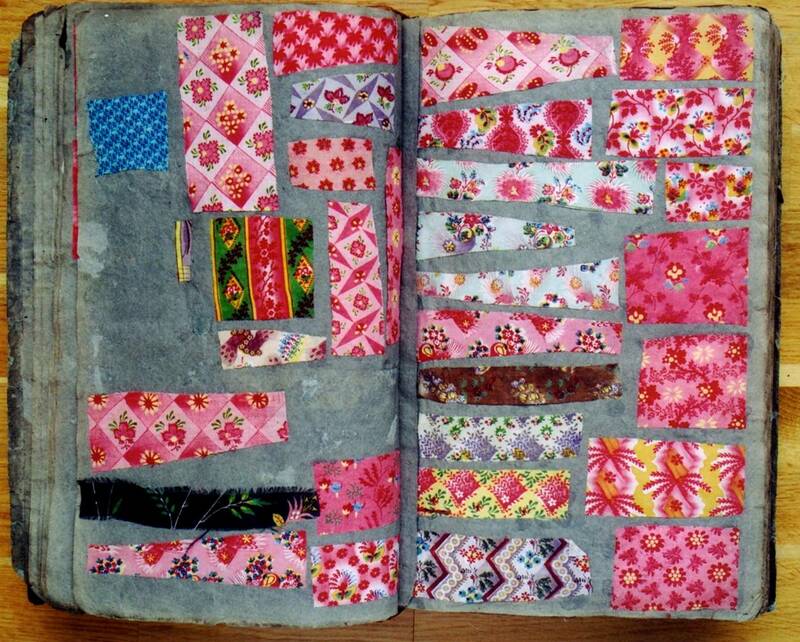 I am working on my daughter's computer today--no scanner and no samples books. The next post will be from home and filled with visuals! 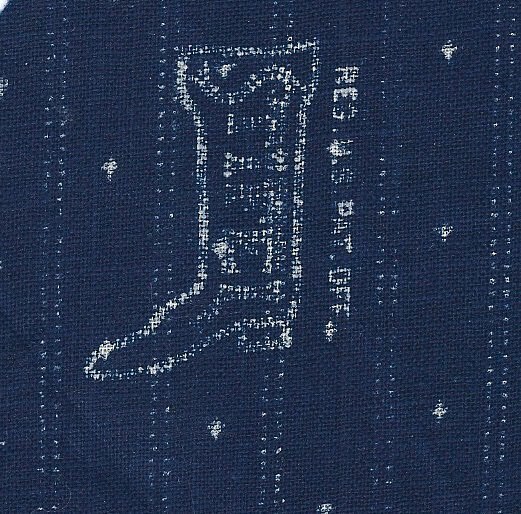 When you do a discharge indigo and use two different discharge pastes, one containing a chrome orange dye, you get an Illuminations. 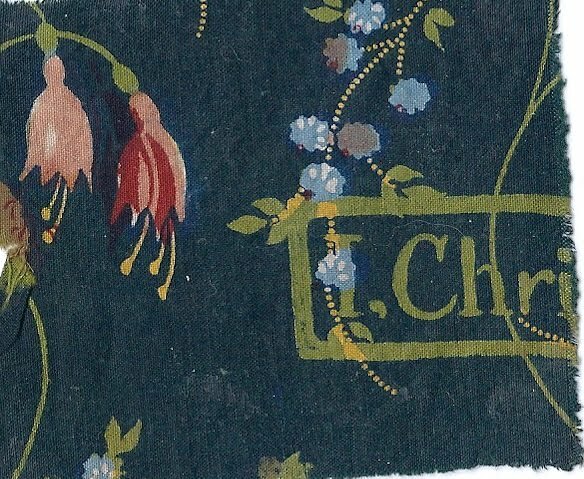 This style of printing is one of my favorites! This is the back of the 3rd block. Note the areas of white and orange showing through. This picture was taken during a tour at the Museum of Printed Textiles Mulhouse, France. Each cubbyhole contained the blocks need for one design. Some have as many as 8 different blocks, others only 5. 18th century wood blocks for textile printing could be as large as 13". 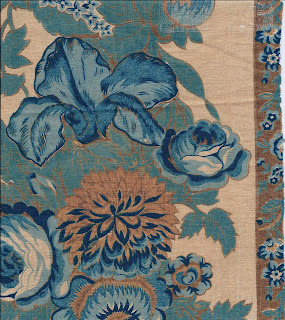 These were known as '3 over' or 3 impressions across fabric that was 38/40" wide. Another common size for blocks was 9 1/2", '4 over' and 7 3/8th", '5 over'. You could see 'pitch pins' in a corner. These metal pins were pounded in at the same height as the wood relief motif and were a placement guide for the printer. I had a very fun customer on Saturday. She and her husband were visiting Montana from Guadeloupe. 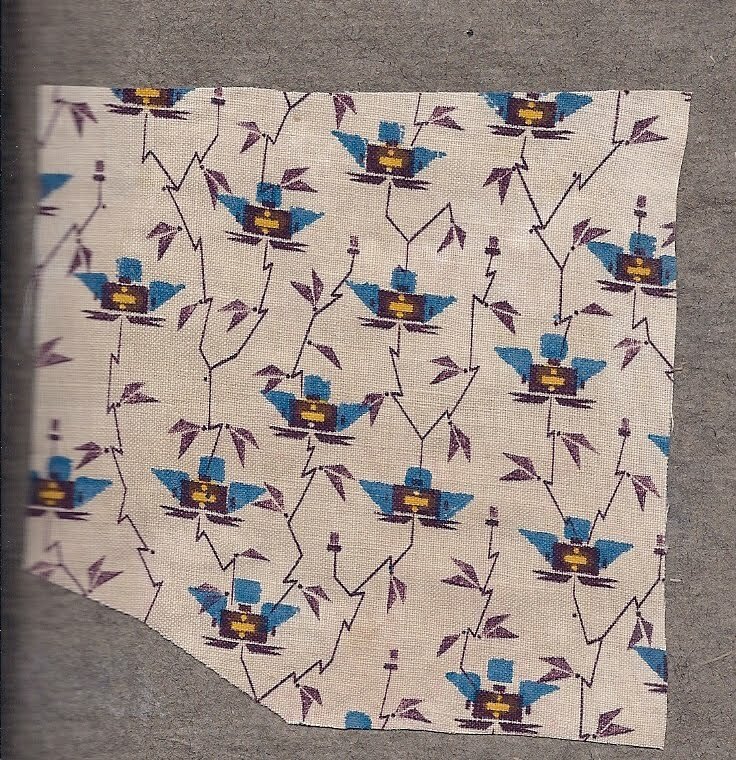 I have sent her fabric in the past. What I did not realize was the package traveled over to France and then back to this hemisphere to the French West Indies and Yolande. We had a lovely visit--mostly in English. I learned about the French West Indies and Marseille (husband's home town). 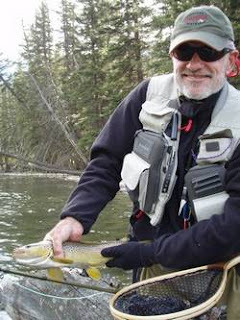 I told them about local places of interest--they were driving from Yellowstone to Glacier National Park. 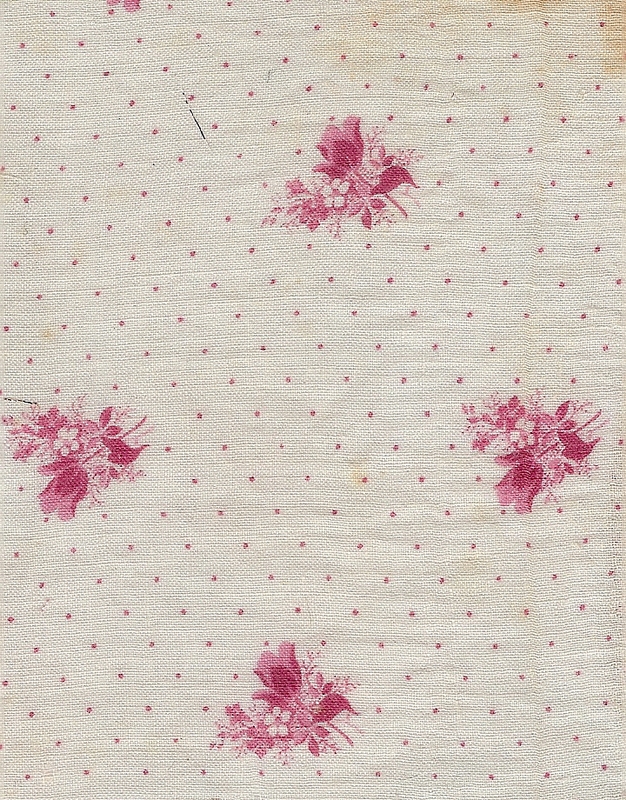 Yolande did manage to pick up a little fabric also! 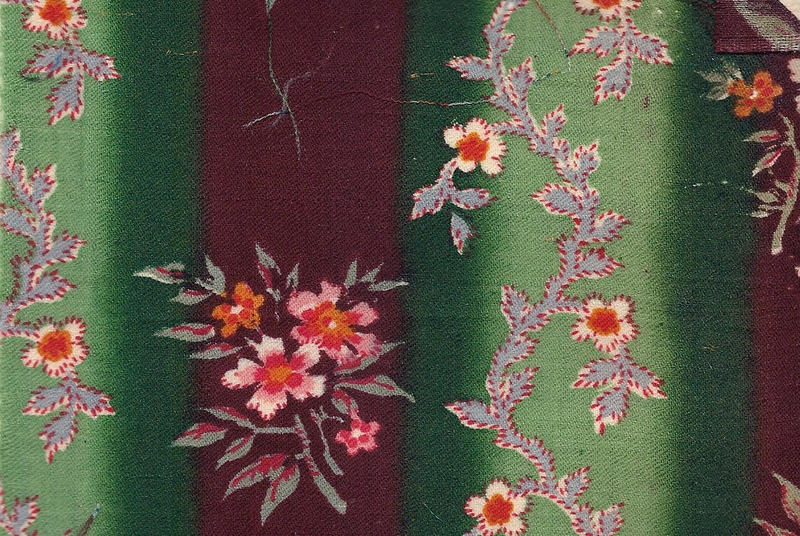 Cochineal, a crimson dye from female beetles that live on cacti native to Mexico and South America, had been used by the Aztec and Mayan peoples of Central America since 1000 B C. The Spanish invaders were amazed at the brilliance of the red fabrics worn by the people of the region and soon were shipping the dried bodies of the female beetle to Europe. 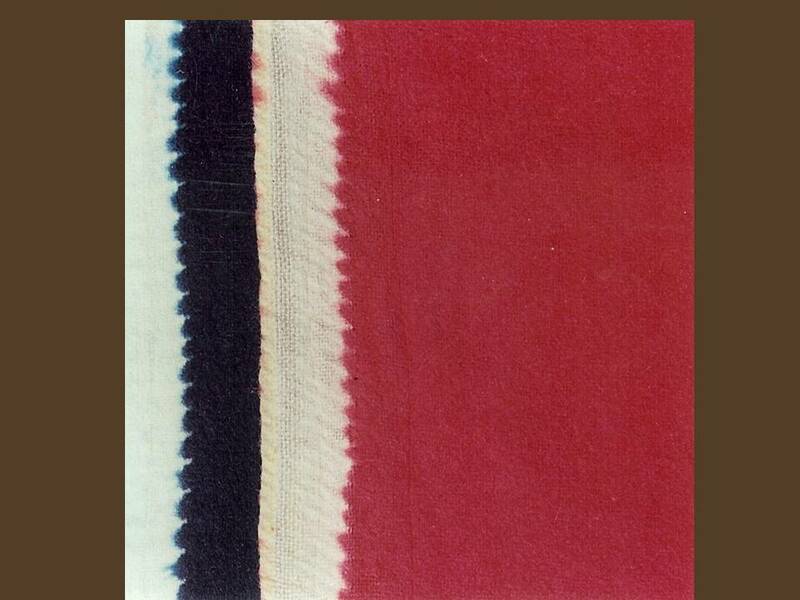 The dye was known as 'red grain' and took 17,000 dried beetles to make 1 ounce of dye stuff. 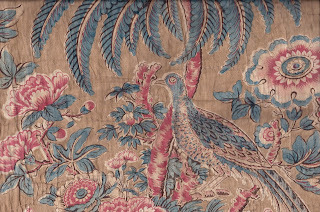 The Spanish kept the source of this very valuable product a secret through most of the 17th century. Silver was the only commodity from New Spain that was more valuable. 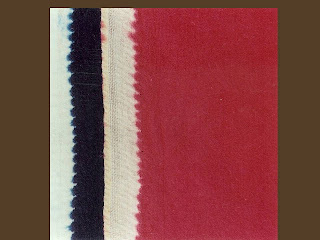 Wool dyed red with cochineal was especially brilliant, more so than the fibers available in pre-Hispanic Central and South America; cotton, agave and yucca. 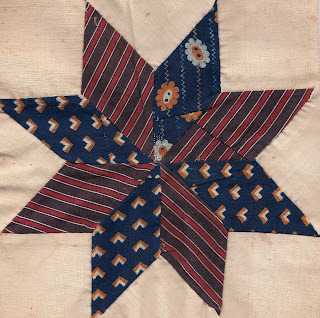 During America's Revolutionary War, the American troops engaged in guerrilla warfare were able to pick off the British officers and cause panic and confusion amongst the soldiers because the 'red coats' of the officers were dyed with cochineal and much brighter than the madder dyed coats of the soldiers. After Mexican independence, some production ( cacti plants and beetles) was moved to the Canary Islands. Cochineal fell out of favor for most textile dyeing with the advent of aniline dyes but is seeing a resurgence today as a natural food coloring. 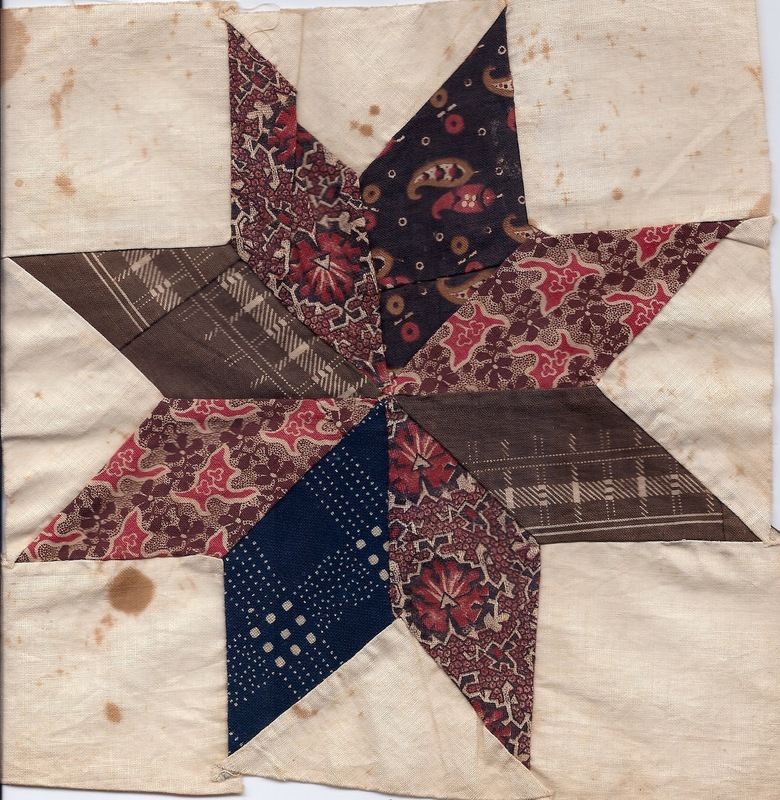 I have been researching the paisley pattern this week. 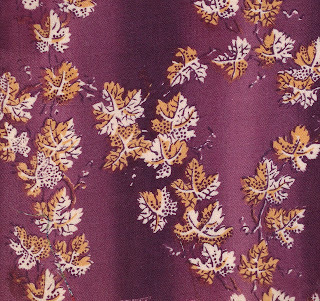 The motif we know today was inspired by the tear drop shaped designs on 17th century Kashmir shawls. 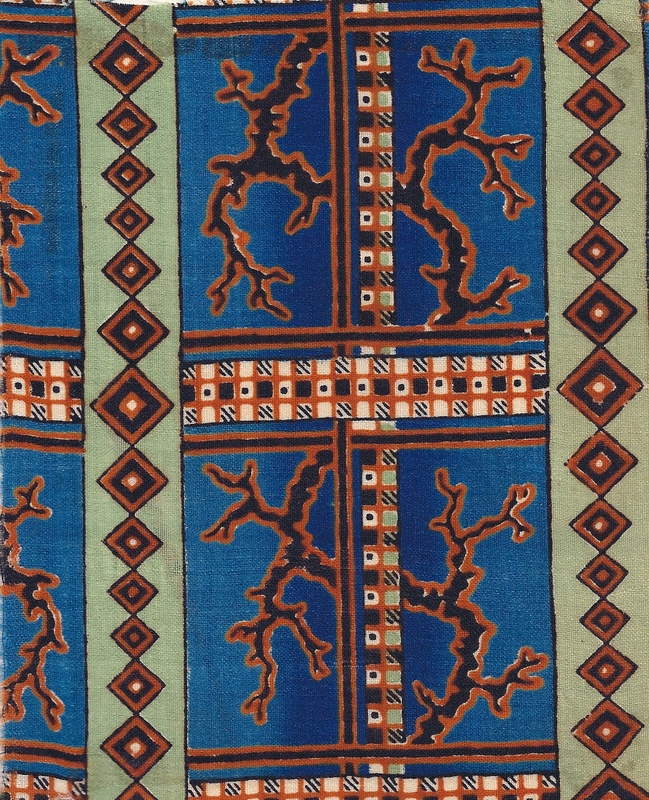 These fine woven textiles were the shoulder mantles of high officials in the Mughal court of that era. 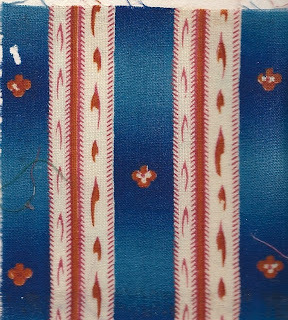 The large motifs woven in the borders were known as boteh. 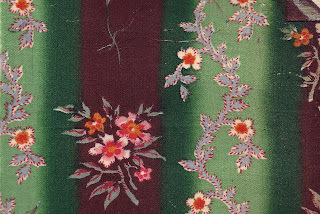 A smaller motif, buti--small flower, was used as a filler pattern in the shawls. 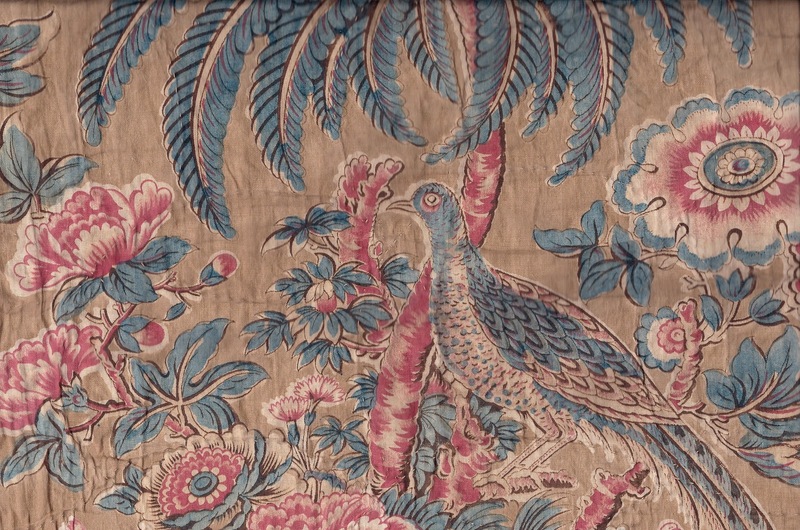 The introduction of the Jacquard loom enabled European weavers to copy the shawls. 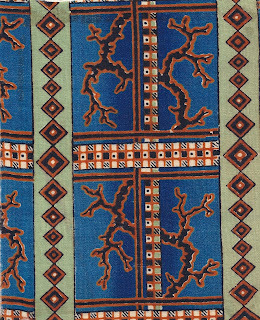 The ones woven in Paisley, Scotland were especially good. 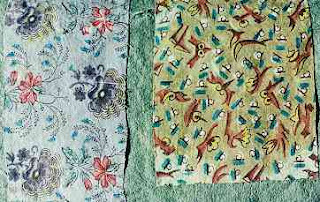 Textile designers also copied the patterns, including the serrated edges of the woven motifs on the shawls, onto printed yardage. This sample is from my Dargate book, c. 1830. In 1847, The Philadelphia Public Ledger installed the new high speed rotary 'lightning' press. It made the all those slow flatbed presses outdated and opened up a new market--cheap paper! 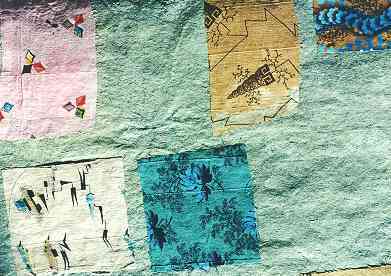 By the 9th century, Arabs were making high quality paper from recycled rags with additional fibers of of linen and cotton. This rag paper was still the standard paper in the 19th century with mainly linen fibers being added to the broken down rags. It was relatively expensive. In the 1840s producers in Germany began mechanically breaking down 'scraps' from the timber industry to create a paper product. 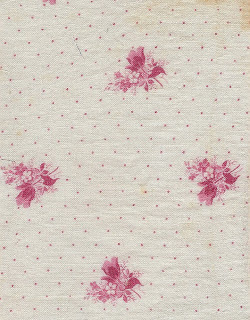 It was this pulp paper that would supply the demand for newsprint. 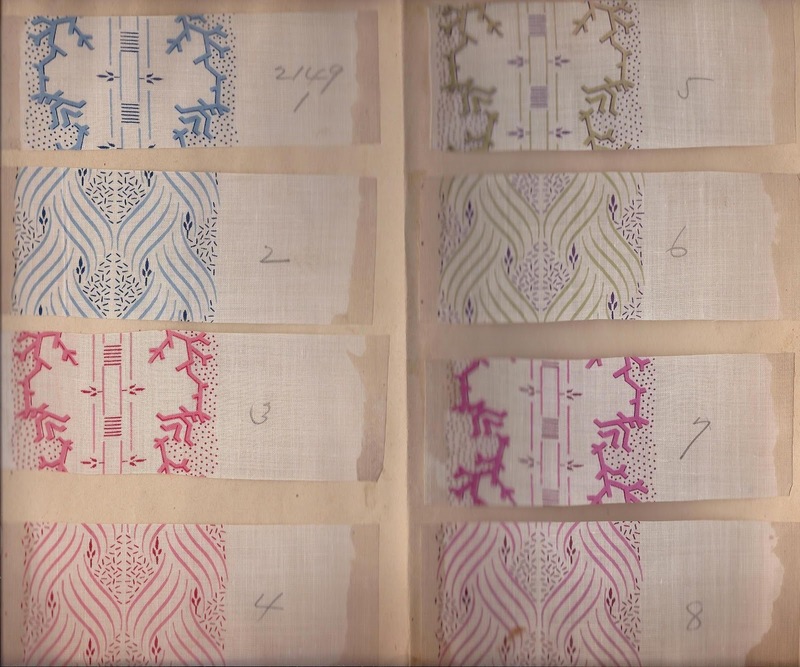 The use of the 19th century rag paper ( archival, non acidic) in my fabric sample ledgers has helped to preserve the vibrant colors of the fabric samples! 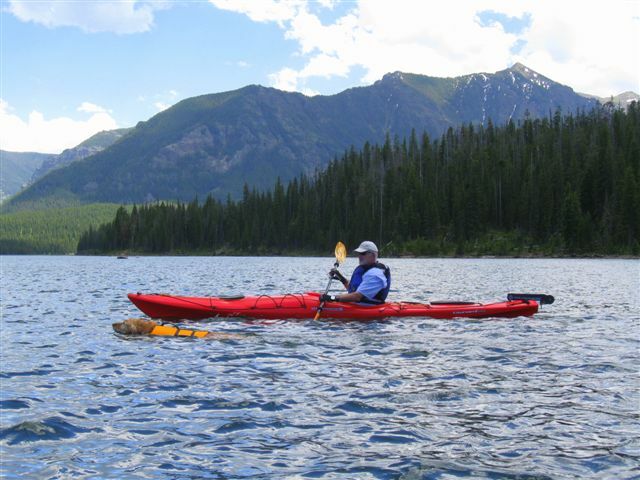 Ahead by a nose--Abby paddling with Ron at Hyalite--south of Bozeman. 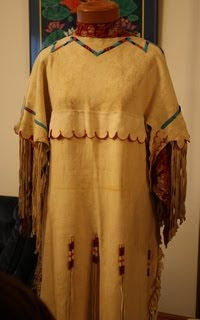 Under the "Dancing in Beauty" tab on the website for Identity by Design discussed last week, there is mention of 'saved list' wool used in the c. 1890 Kiowa headdress as well as a rainbow list on the sleeve of a beautiful comtemporary Kiowa dress. I have always found this term intriguing.' 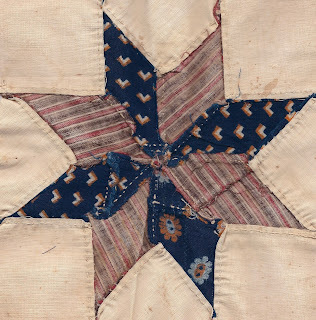 List' refers to selvedge--the edge of the fabric which is more tightly woven than the body to prevent fraying. 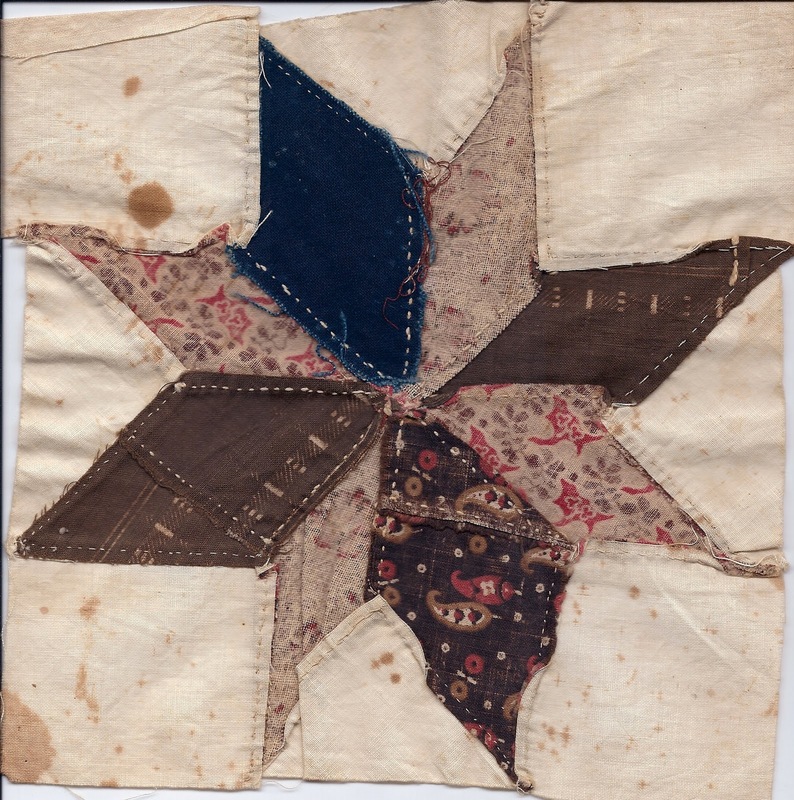 It was often of another fiber and could be coarser than the center of the cloth. 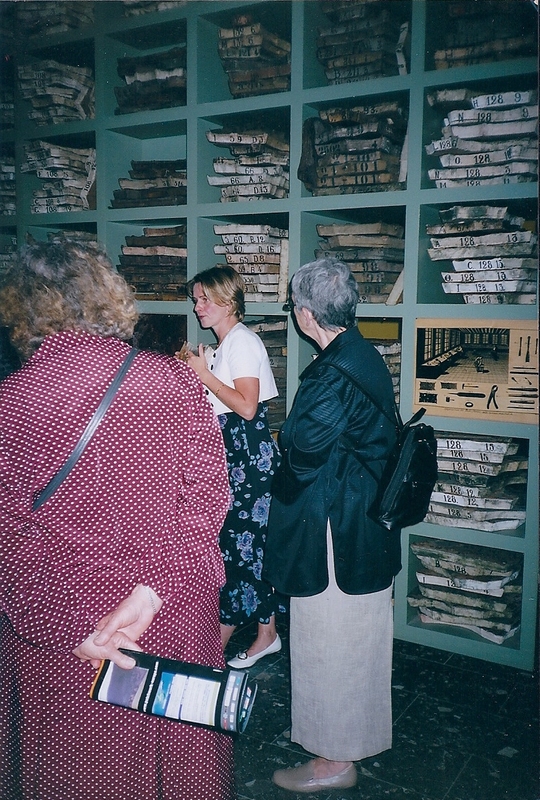 'Saved list' means the list or selvedge kept white during the wool dying process. 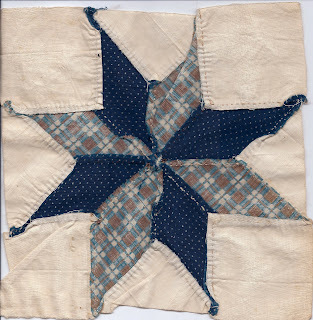 It was encased by folding a piece of webbing lengthwise and whip stitching it securely in place. This prevented the coarser, more absorbant selvedge fibers from taking up the expensive the dye stuffs. The edge was usually discarded in European garments but was much admired by the North American Indians during the Fur Trade Era and even afterwards during the Reservation period. It was often used decoratively at the side, bottom or on the sleeves. 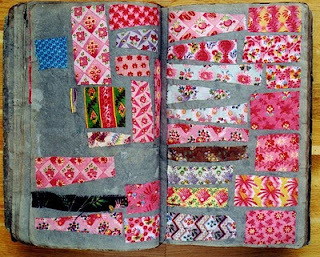 The photo below is of two different pieces of saved list--one indigo the other scarlet, side by side. 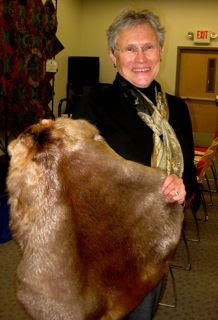 This is a picture of me holding a beautiful beaver pelt given to me by my husband as a wedding present 43 years ago. 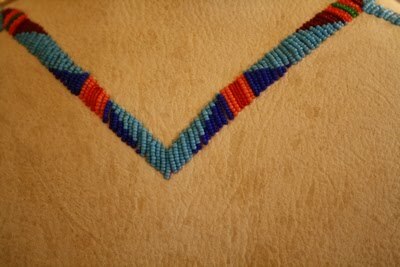 He had trapped and prepared the pelt. I was delighted with the gift but did not have a clue I would be using it as part of my Furs on a Stick lecture! This picture was taken last fall in Minneapolis. In 2007 I had the good fortune to visit the National Museum of the American Indian in Washington DC. "Identity by Design" was on display. It was wonderful! Here is the link to information about the display.There is a 'catalog' for the exhibit--"Identity by Design, tradition, change and celebration in native women's dresses", edited my Emil Her Many Horses. This was one of 6 simultaneous performances--Tony Ballog and Roma Nota. They were amazing!! dolls. I spoke with Mary Lou and she proudly told me she has received two national awards for her dolls. We also talked about the Crow Reservation (nearby in Montana), the view from her home and how she goes about crafting her dolls. 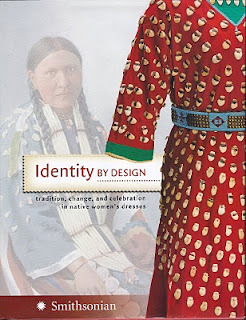 If you can get the book/catalog of Identity by Design through Amazon or on inter library loan, I know you would enjoy it. And if you get a chance to see Mary Lou's dolls, she will be in Santa Fe soon, you will be enchanted! was established in Wheeling, WV ( my hometown) in 1835. 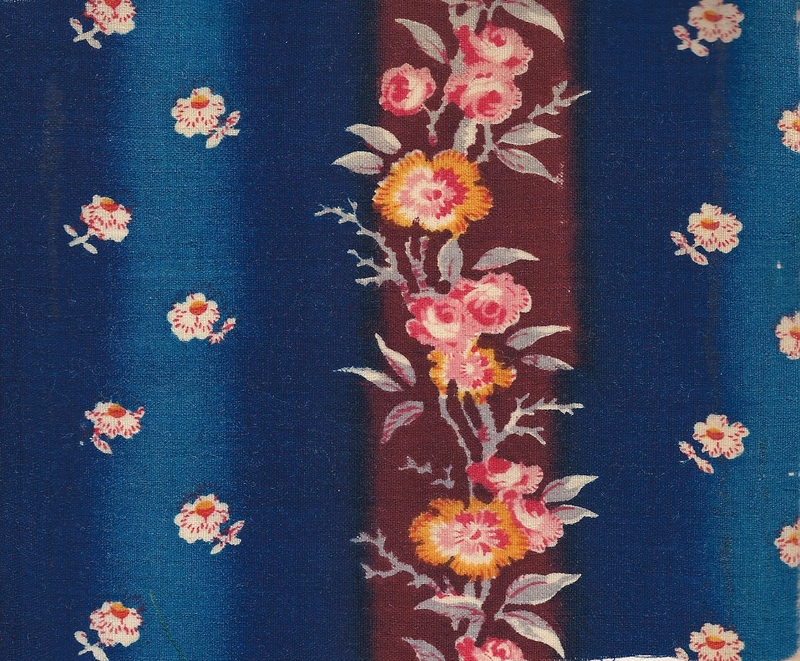 Their principal production was indigo dyed prints and drills. The heavier weight drills were used mainly by clothing manufacturers. 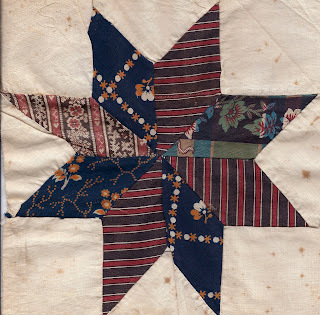 The goods, know locally as West Virginia calico, were sold through the Sears, Roebuck and company catalog and internationally to Latin America, India, the Philippines, Canada and West Africa. 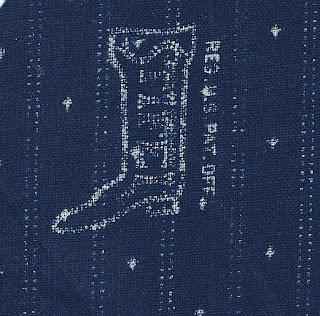 Whenever I see old indigo blocks and tops, I am always turning them over looking for the Stifel logo on the back. 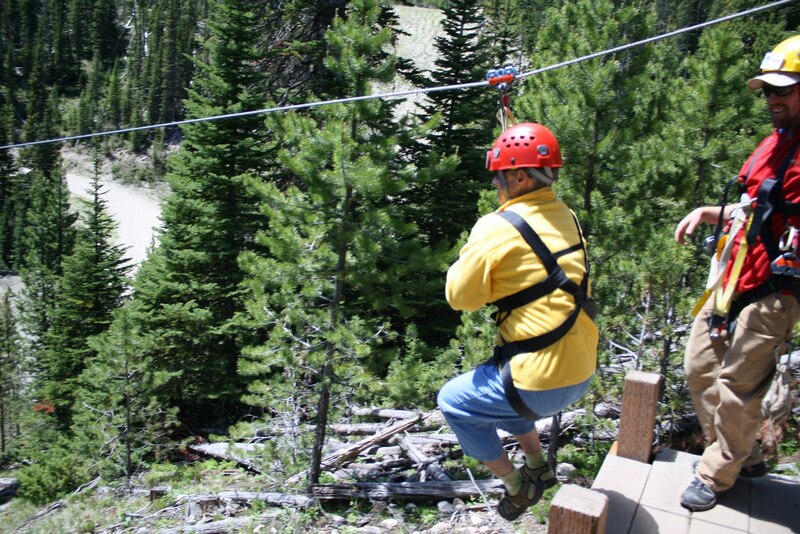 On July 4th we ran the zipline at Big Sky, MT for an adventure! Equipment check and then---just step off :) It was very much fun! !